Andy’s Room is a tradition on the Disney Dream for the kids. During certain times of the day, the kids room is closed. 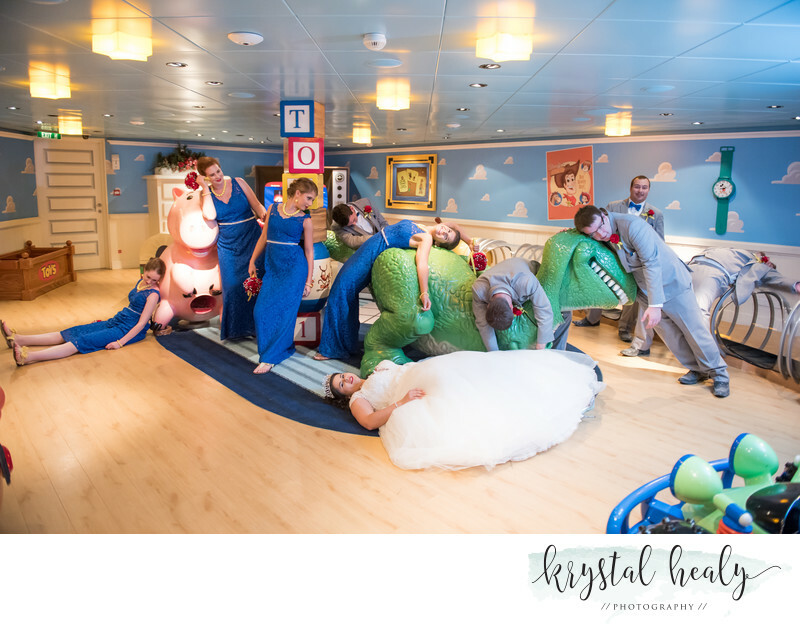 It was during that time that the Disney Cast members let our bride, groom, and entire wedding party come in and play in Andys Room (from Toy Story) for wedding photos. It was such a great opportunity for us to beat the heat of the Bahamas and still get some amazing wedding photos inside the ship AND in the air conditioning! Not many people can claim that they have their wedding photos in Andy’s Room from Toy Story, or the Millennium Falcon from Star Wars. It is certainly a specific perk to those getting married on the Disney Dream or those having their ceremony on Disney's Castaway Cay. We started the day getting ready in the bride and grooms suite on the concierge level. We had hair and makeup in the room, and then we went exploring the ship for photos before the 10am beach ceremony on Pelican Beach on the island. The coordinator went ahead to the island to prepare the ceremony and the bride, her father and I went on a golf cart right before the ceremony. The bride was asked for autographs by little girls and got many shouts of congratulations. After the ceremony we went back on the boat for cake and champagne and then up to the kids section for the picture you see here! Such a great experience. Location: Disney Cruise Line- Port Canaveral Terminal #A 9155 Charles M. Rowland Dr. Port Canaveral, FL 32920.